We’ve gathered haunting images of shipwrecks from the murky depths of seas across the globe. Dive in! Divers from the University of Hawaii’s Marine Option Program inspect an amphibious vehicle called the Landing Vehicle Tracked-4 (LVT–4) that was introduced by the United States in World War II. The wreck was found along the southern coast of Maui. The shipwreck of the barge “Northern Light” was found about 2.5 miles (4 kilometers) southeast of Key Largo’s Elbow Reef in the Florida Keys at a depth of 190 feet (57.9 meters). The ship was built in 1888 as a freighter by Globe Iron Works of Cleveland, Ohio, but was converted into a barge in 1927. It’s believed that “Northern Light” sank in 1930 after it struck a floating object during a severe storm. NOAA diver John Brooks inspects the remains of the vessel “USS MACAW” located among the reefs of Midway Island within the Northwestern Hawaiian Islands. The shipwreck serves as a reminder of the valuable contributions of the Naval Air Facility at Midway during World War II, and is part of Hawaii’s Papahanaumokuakea (Northwestern Hawaiian Islands) Marine National Monument. Also located within Hawaii’s Papahanaumokuakea Marine National Monument, the “Hoei Maru” shipwreck rests at the bottom of Kure Atoll — the most remote of the Northwestern Hawaiian Islands. The “Hoei Maru” is one of the vessels shipwrecked on the small island’s surrounding reefs. The “Paul Palmer” was built in 1902 and operated as a schooner in the New England coal trade. In June 1913, a fire broke out on the ship and the crew abandoned the vessel. Damage from the blaze caused “Paul Palmer” to sink to its final resting place at the bottom of the mouth of Massachusetts Bay, an area now known as the Stellwagen Bank National Marine Sanctuary. The above photo of the wreck shows fishing nets tangled in its partially buried remains. hown here, Paul Palmer’s wooden hull, now grown over with coral and serving as a colorful home to various fish and other marine life. Divers from the University of Hawaii’s Marine Option Program measure and map out an unidentified vessel. The craft was found during a survey of sunken World War II-era wrecks in the waters close to the shore of Makena in Maui, Hawaii. Another ship located at Hawaii’s Kure Atoll reef, the “Dunnottar Castle” was a 258-foot (79-meter) cargo ship that was built in 1874 in Scotland. It was making its way from Sydney, Australia, to Wilmington, Calif., with a load of coal when it struck a reef and sank in July 1886. The wreck was initially explored by marine archaeologists in 2006. Although it has become flattened over time, the ship miraculously remained largely intact. Its ruins, including an iron hull, steel yards, masts and anchors, are inhabited by fish, clams and shrimp, and some portions of the ship are covered in coral. NOAA diver investigates the lower deck of the Great Lakes wooden freighter “SS Florida,” which sank after smashing into the steamship “RMS Republic” in January 1909. It now rests on the murky bottom of “Shipwreck Alley” in the Thunder Bay National Marine Sanctuary, located in northwestern Lake Huron, Mich. Built in Northern Ireland in 1909, the “RMS Titanic” was also known as the “unsinkable ship,” because it had a double-bottom hull divided into 16 compartments that were presumed to be watertight. The 882.5-foot-long (268.9 meters) craft sank in April 1912 after it struck an iceberg off southern Newfoundland, and now rests on the ocean floor at a depth of 12,460 feet (3.7 kilometers). If you interesting to take over this Blog, please do not hesitate to email me y4ppy@yahoo.com for further detail. Four shipwrecks buried off the coast of Israel may reveal the site of an ancient Greek harbor. Archaeologists have discovered four 19th-century warships, and possibly the remains of an ancient Greek harbor, off the coast of Israel. The fleet was found at the ancient port of Akko, one of the major ports of the Mediterranean during the Hellenistic period from 300 B.C. to 100 B.C. The new discoveries could point to even more ancient, elusive shipwrecks. The team found the four warships in 2011 using sound waves to probe beneath the ocean floor off the coast of Akko in northern Israel. The city has been a busy port since antiquity. After storms briefly washed away some of the sediment burying the ships, the Israeli Antiquities Authority peeked into one of the 105-foot (32-meter)-long ships. Sediment has since reburied the fleet. Wood from the ship came from Turkey, laboratory analysis showed. An analysis of some of the wreckage revealed that the wood from the ship came from Turkey. The research team believes the ship was part of a 19th century Egyptian naval fleet. The researchers believe the ships, once part of an Egyptian fleet, sank during the Egyptian Ottoman war when Admiral Osman Nurredin Bey attempted to retake the city of Akko in 1831. In the process of excavating in the area, the team also found the remains of a ship shed that was possibly used to bring in warships during the Hellenistic period. At the site, they found remnants of Hellenistic stonework, ancient pottery, mooring materials and a stone quay. These fragments suggest a much older, ancient Greek port may lie beneath the seafloor — along with even more ancient shipwrecks. “We’ve got fragmentary historic records for this area in the Hellenistic period, and now we’ve found a very important feature from the ancient harbor. Ancient shipwrecks are another piece of the puzzle that will help us to rewrite the story of this region at a critical time in Mediterranean history,” Buxton said in a statement. The findings were presented at the annual meeting of the American Schools of Oriental Research on Nov. 15 and 17 in Chicago. 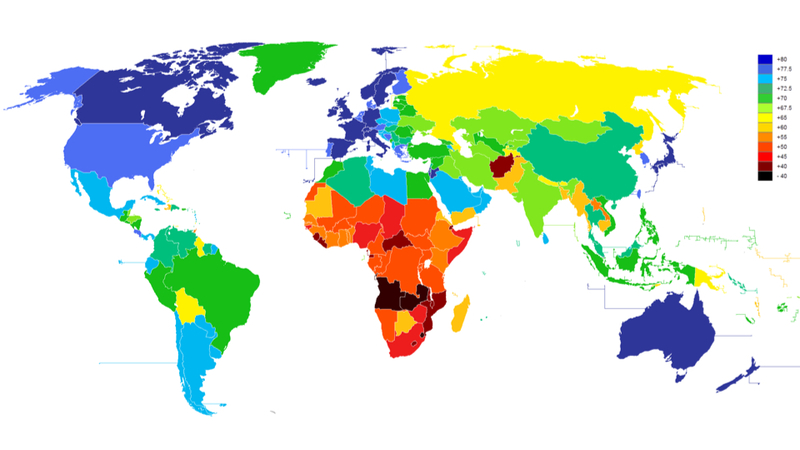 Here now to provide a some perspective on the matter of mortality is a variegated patchwork comprising 188 of the world’s countries, with each nation color-coded in accordance with the average life expectancy of its citizens. Click here for a hi-res version of the map up top, and here for an interactive one (the applet also allows for mapping by gender). This entry contains the average number of years to be lived by a group of people born in the same year, if mortality at each age remains constant in the future. The entry includes total population as well as themale and female components. 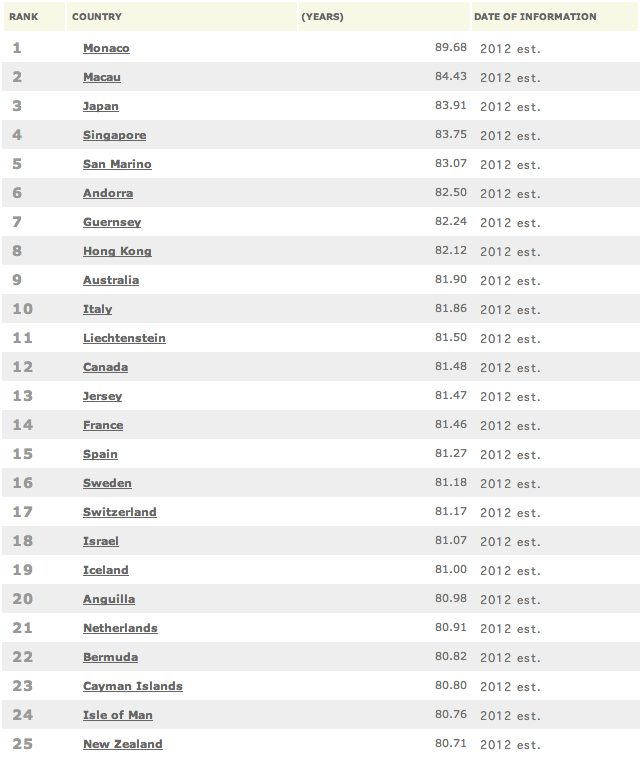 Life expectancy at birth is also a measure of overall quality of life in a country and summarizes the mortality at all ages. It can also be thought of as indicating the potential return on investment in human capital and is necessary for the calculation of various actuarial measures. Solar powered satellites don’t produce any greenhouse gases, nor do they take up valuable real estate on Earth. Once the initial costs are met, they would be relatively cheap to maintain; the solar modules used for generating solar energy have a long service life, not to mention the astounding ROI that would come from a virtually unlimited energy source. Additionally, they’re not constrained by night/day cycles, the weather, or the changing seasons. And indeed, they would be much more efficient than any kind of ground-based station. The collection of solar energy in space is seven times greater per unit area than on the surface of the planet. Moreover, the amount of solar energy available up there is staggering — on the order of billions of times greater than what we draw today; the Earth receives only one part in 2.3 billion of the Sun’s output. The potential for scalability is enormous, to say the least. 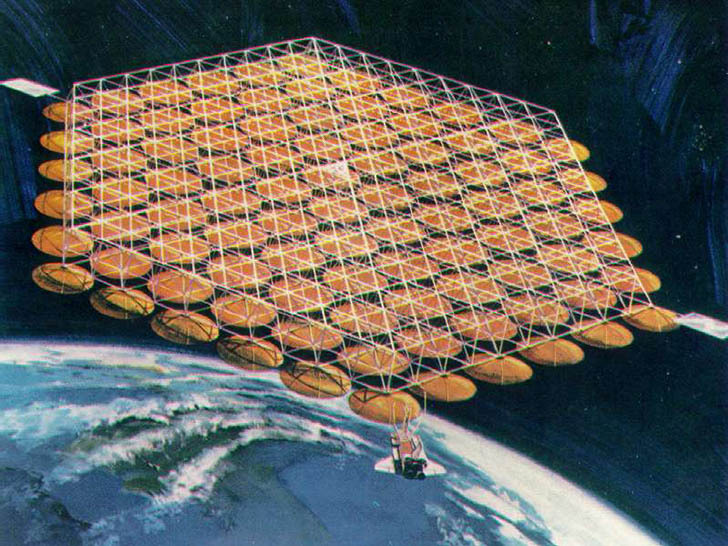 Solar powered satellites won’t be prone to terrorist attacks and they’ll reduce geopolitical pressure for oil. According to futurist Keith Henson, space-based solar could be used to power vehicles, like electric cars, or by enabling the production of synthetic fuels — which at a penny per kiloWatt hour would result in gasoline that costs one dollar a gallon. A number of visionaries have updated Glaser’s vision to include the use of a microwave wireless power transmitter. 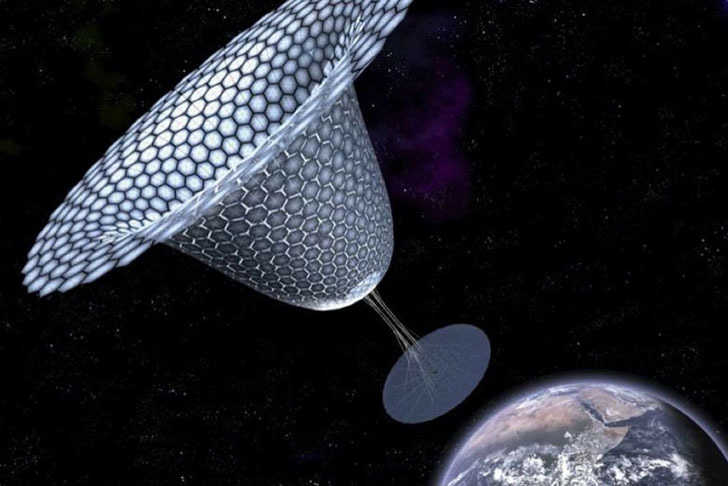 This would involve large discrete structures (like a solar array and transmitter) that would have to be assembled in space. SPS systems could also include a modular electric/diode array laser WPT concept, involving self-assembling solar power-laser-thermal modules. 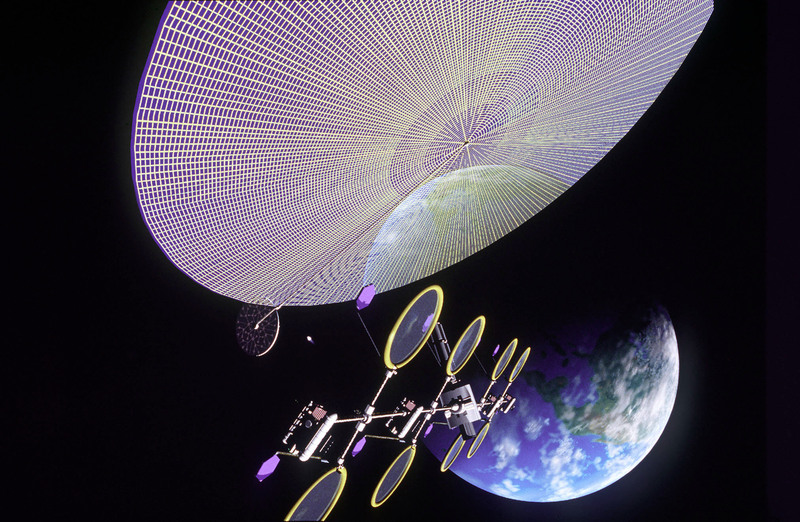 Other designs call for an extremely modular microwave WPT SPS “sandwich structure” concept, requiring a significant number of small solar power-microwave-thermal modules that would be robotically assembled on orbit. But to make it happen, we’ll need to develop low-cost, environmentally-friendly launch vehicles. Eventually we’ll send the materials up in a space elevator, but until then we’ll have to come up with something more efficient. Thankfully, SpaceX and other private firms are already working on more efficient launch solutions. 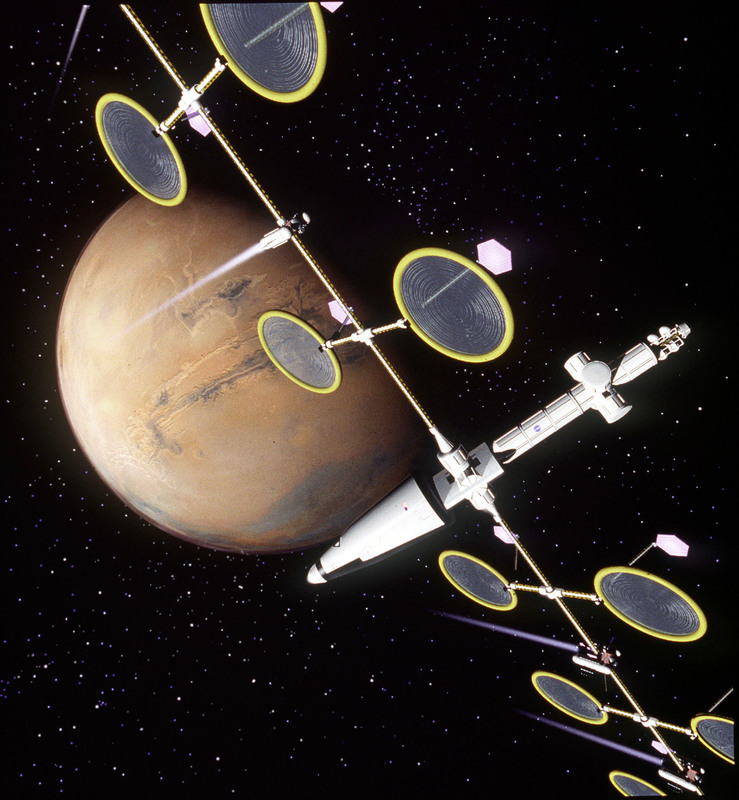 Additionally, we’ll require large scale construction and operations stations in orbit — space-based workplaces that would be more complex, larger, and more energy-demanding than the ISS. They would allow for the production of large, simple panels, that are easy to assemble and consist of many identical parts. Eventually, it may be possible to construct an entire flotilla of these solar collectors using materials extracted from asteroids. As word gets out about the potential for SPS, and as the technology catches up to the idea, a number of design proposals have been put forth; this isn’t just idle speculation anymore — it’s something that’s just about ready for prime-time. For example, there’s SPS-ALPHA (Solar Power Satellite via Arbitrarily Large PHased Array) which is being developed by NASA’s John Mankins. Using a “biomimetic” approach, the project calls for huge platforms constructed from tens of thousands of small elements that could deliver tens to thousands of megawatts via wireless power transmission. It would do this by using a large array of individually controlled thin-film mirrors outfitted on the curved surface of a satellite. 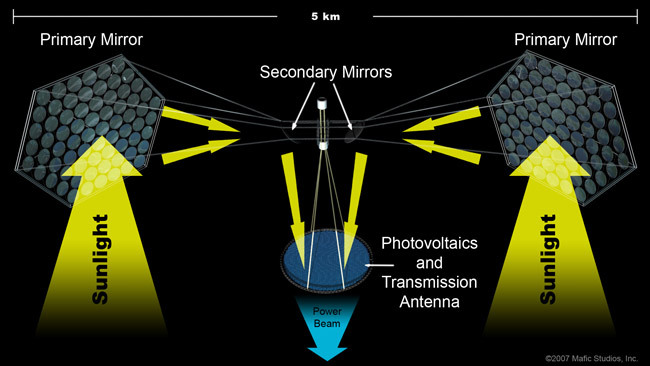 These adjustable mirrors would intercept and redirect incoming sunlight toward photovoltaic cells affixed to the backside of the solar power satellite’s large array. 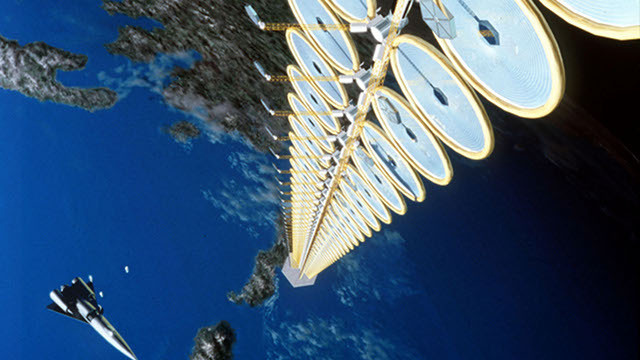 The Earth-pointing side of the array would be tiled with a collection of microwave-power transmission panels that generate the coherent, low-intensity beam of radio frequency energy and transmits that energy to Earth. And what’s particularly cool about this concept is that it would enable the construction of a solar-power satellite that can be assembled entirely from individual system elements that weigh no more than 110 to 440 pounds (50 to 200 kilograms), allowing all pieces to be mass produced at low cost. There’s also Japan’s JAXA’s SBSP System. The Japanese space agency want to get a prototype up and running by 2020, and a fully operational system by 2030. Their system is designed to run in a stationary orbit about 22,400 miles above the equator where it will absorb the sunlight with chromium-enhanced solar cells. The SBSP System will transmit energy to Earth using laser beams at about 42% solar-to-laser energy efficiency. Each satellite will beam the energy to a 1.8-mile wide receiving station that’ll produce one gigawatt of electricity — what’s enough to power 500,000 homes. 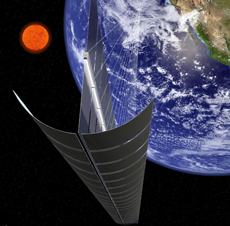 Other examples include the Sun Tower, the Dyson-Harrop Satellite (which would harness solarwind power), Solar Disc, and the European Sail Tower SPS. SPS systems have been discussed since the 1970s and have been reviewed periodically by various stakeholders in United States and elsewhere — but the idea has never been seen as something that’s cost effective or technologically feasible. These sentiments are changing, however. Last year, the International Academy of Astronautics published an exhaustive reportlauding the benefits of space-based solar power, urging the international community to take the prospect seriously. The report contained over a dozen recommendations on how to get started, while predicting that space solar power will be technically feasible within 10 to 20 years using technologies thatalready exist. Additionally, flight experiments will be required, as will be the ironing-out of any policy or regulatory issues — what could definitely take some time. Needless to say, some groups and individuals may take great exception to the idea of having microwaves and laser beams shooting down onto the Earth’s surface — not to mention the nightmarish potential for the weaponization of this technology. But given the incredible benefits — not to mention the tremendous need — it’s a no-brainer that this needs to happen. 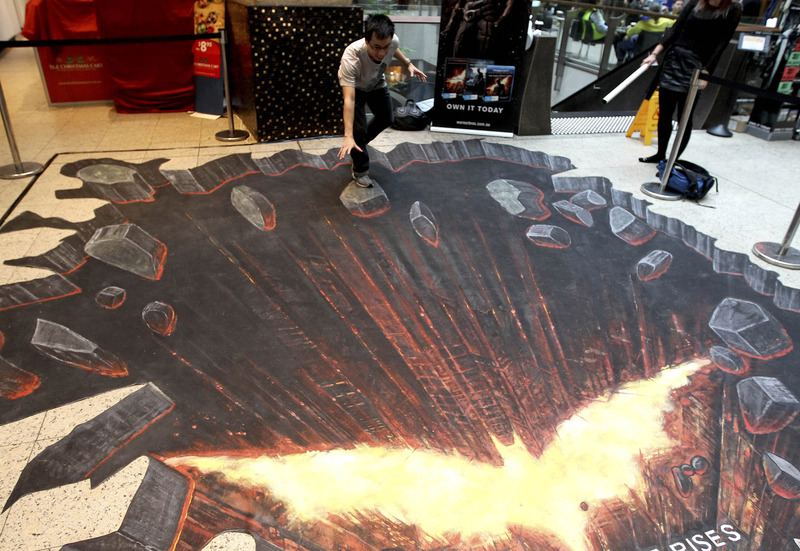 An artist created this incredible 3D chalk art for the Dark Knight Rises film in a mall in Sydney, Australia. It looks like the glowing bat symbol has eaten away the floor and the entire shopping center is crumbling into the Earth’s superheated maw. Click to enlarge! 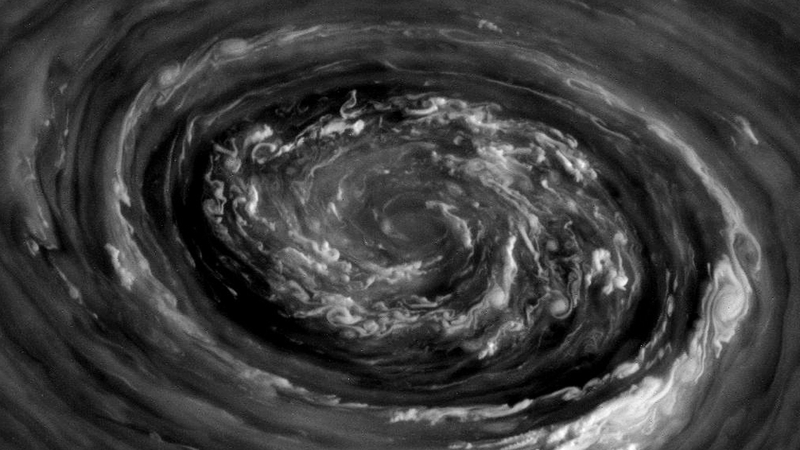 This swirling maelstrom of clouds is what was seen over Saturn’s north pole yesterday, November 27, by NASA’s Cassini spacecraft. This is a raw image, acquired in polarized light, from a distance of 238,045 miles (383,097 kilometers)… all I did was remove some of the hot pixels that are commonly found on Cassini images taken with longer exposures. 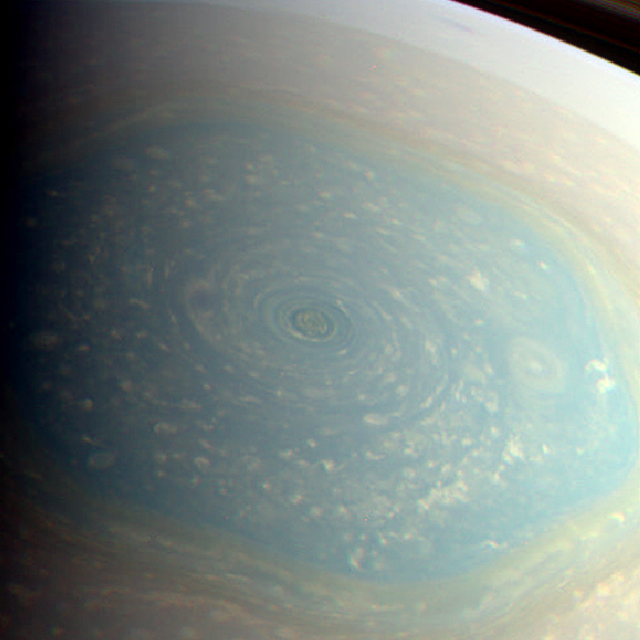 Captured with wider angle in this image the hexagon structure can be made out as well as the vortex, which sits at the center just over the pole. 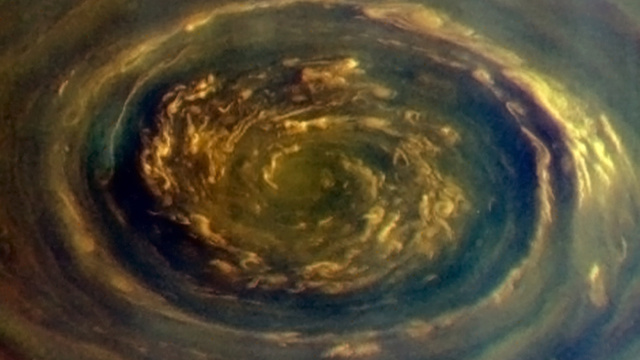 Saturn’s hexagon is about 25,000 km (15,500 miles) in diameter… large enough to fit almost four Earths inside. This image was also acquired today. 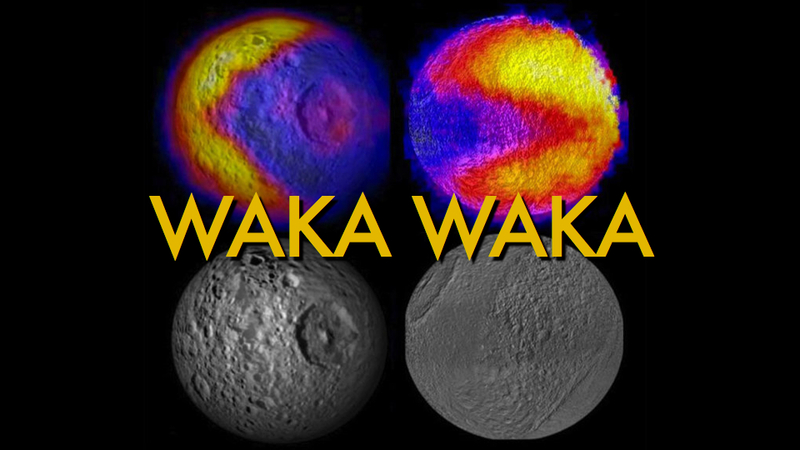 Astronomers now know that the Saturnian system has not one, but two ”Pac-Man” moons — and there could be many, many more. Back in 2010, infrared heat maps of Mimas (also known as Saturn’s “Death Star” moon, for reasons that should be fully armed, operational and obvious), gathered by NASA’s Cassini spacecraft, revealed a Pac-Man shaped heat signature on its surface (pictured up top and below, on the left). 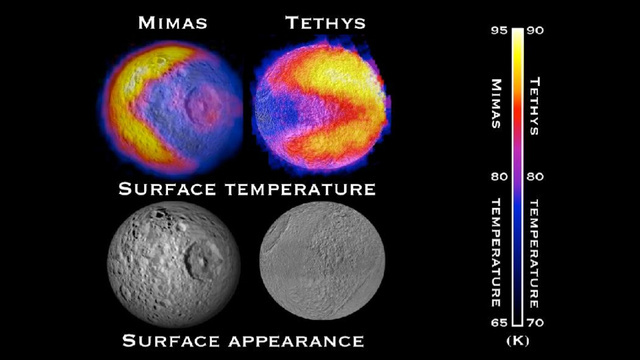 Now, Cassini has returned evidence that Saturn’s icy moon Tethys is covered in a similar pattern. 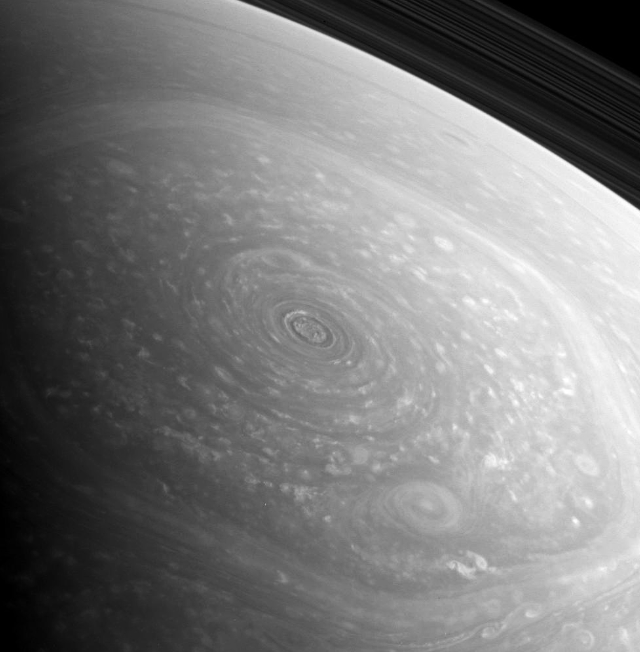 “Finding a second Pac-Man in the Saturn system tells us that the processes creating these Pac-Men are more widespread than previously thought,” said Carly Howett, the lead author of the paper describing the so-called “thermal anomaly,” published in the latest issue of the journalIcarus.